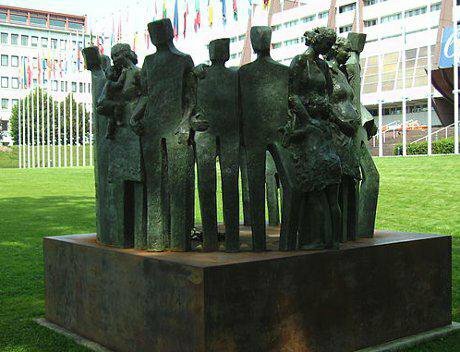 Post-war Europe's moral conscience: the Council of Europe in Strasbourg. Wikimedia Commons / EPei. Creative Commons.News of unrest in Ukraine earlier this year was greeted with mild then growing panic by European governments, concerned about supplies of gas to the continent’s energy network. The situation, like an earlier shutdown of gas supplies by Russia, again highlighted how closely energy security is tied to geopolitics. Moreover, the question hung in the air: could Ukraine really be the only state open to potential incursion by Russia? Later, on 6 May in Azerbaijan, a Baku court sentenced eight N!DA youth movement activists to between six and eight years in jail after they were convicted on charges of possessing drugs, explosives and intending to cause public disorder. In April, the peace activist Leyla Yunus and her husband were detained at Baku airport, prompting calls from the Council of Europe’s commissioner for human rights, Nils Muižnieks, and others for the Azerbaijani government to “immediately halt such practice” and “to pay urgent attention to these issues so as to comply with Azerbaijan’s human rights obligations and commitments as a member state of the Council of Europe”. These latest arrests and those of others who have been critical of the government—journalists who report on state corruption, writers and online activists—are allegedly due to issues unrelated to their political views. Drug trafficking, corruption, weapons possession, leaking of state secrets to the US … all are allegations which have been levelled against civil-society organisations and led to activists being jailed. Baku has defended its actions to the Council of Europe, saying activists’ arrests are not linked to their anti-government stance. But if you really wanted to silence and discredit your critics, wouldn’t you find another, less heroic-seeming reason for imprisoning them? In another criticised move intensifying pressure on basic freedoms, in February the government signed into law tough new finance rules. These have restricted the ability of NGOs to operate in Azerbaijan by burdening them with a bureaucracy which Amnesty International says may push to the limits organisations’ ability to operate legitimately. So how are all these issues connected? Economically, Azerbaijan, despite its small population, is a key state to members of the European Union and vice versa. The British trade envoy to the region, Charles Hendry, has pointed out that in addition to the UK being Azerbaijan’s 15th largest trading partner (not top rank, granted, but significant,) it is “by far the biggest investor in Azerbaijan through BP and other companies in that sector” and the country is “increasingly important to the British economy”. And that of course means diplomatic channels must be navigated particularly carefully. As one of the 47 members of the Council of Europe, Azerbaijan is bound by the European Convention on Human Rights. Azerbaijan has so far sidestepped the Ukraine crisis, with good reason. As a former member of the Soviet Union and a recipient of funding from the EU’s eastern-neighbourhood programme, it is in a position to benefit both from Russia’s desire to expand its own, EU-rivalling, customs union and the EU’s desire to expand its influence beyond its borders. And then there are the energy reserves. Although analysts believe production from its sizeable oil reserves, so important for the Azerbaijani economy, is in decline, the huge Shah Deniz gas field is within its borders and is a useful alternative supplier of gas to Europe. Azerbaijani gas, arriving at the Turkish terminal of the Baku-Tbilisi-Ceyhan pipeline, can help Europe reduce its energy dependency on Russia and thus moderate the impact of the problematic relationship with Moscow. Geopolitically, then, Azerbaijan has advantages it could exploit; mounting EU concerns about clampdowns on NGOs and those campaigning for fundamental democratic freedoms must be delicately balanced against a pragmatic need to enhance Europe’s energy security, something that has become even more acute over the last few months. Equally, however, concerns that Moscow may turn its imperial attention to Baku mean Azerbaijan must play its foreign-policy hand carefully and be sure not to upset its huge western partner and potential ally. Lastly but critically, Azerbaijan is one of the sides in a particularly entrenched and bitter “frozen conflict”, the dispute with Armenia over Nagorno Karabakh. Russia is one of the members of the Organisation for Security and Co-operation in Europe overseeing negotiations and in 1994 it brokered a ceasefire which saw Karabakh plus swathes of Azeri territory around the enclave become Armenian. Russia is not averse to playing diplomatic hardball for its own advantage and Azerbaijan will be mindful of Russia’s influence in this sore conflict. But for how long can Azerbaijan resist calls for action? Just weeks before it took on the role of chair of the Council of Europe, a highly critical report emerged from that very organisation—from the office of Muižnieks. In it the human-rights commissioner called for the release of “all persons who are in detention because of the views they hold and express” and said the president, Ilham Aliyev, should make this a priority. He rejected the suggestion that those arrested were not being punished for their views. He said that the charges “lack credibility and often follow critical reports or postings on the Internet” and deplored what he said was a rising trend. And despite slight improvements to Azerbaijan’s defamation law, which treats defamation as a criminal offence punishable by imprisonment rather than a civil infraction, Muižnieks’ report called urgently for more positive action from Baku. As one of the 47 members of the Council of Europe, Azerbaijan is bound by the European Convention on Human Rights. The obvious question is: can a state which is so openly denying its critics their human rights un-hypocritically take the chair of the Council of Europe—especially when it is the subject of such an unflattering report from within it? Last year Aliyev was elected to a third term of office—there being no limit to how many he may serve under Azerbaijani law—following a pattern of authoritarianism, comprehensively criticised in the 2012 European Stability Report report “Caviar Diplomacy”, which did little to boost Azerbaijan’s image among human-rights groups. There is an opportunity for positive action as it assumes the chair of the Council of Europe but, given its historic and recent behaviour and the developments in Ukraine, the question of the shape this could take has become more complex. Some highly-skilled diplomacy as well as strong political will will be required on all sides if Azerbaijan is to improve its human-rights record to the satisfaction of its many critics. The credibility of the Council of Europe itself is at stake if it doesn’t.